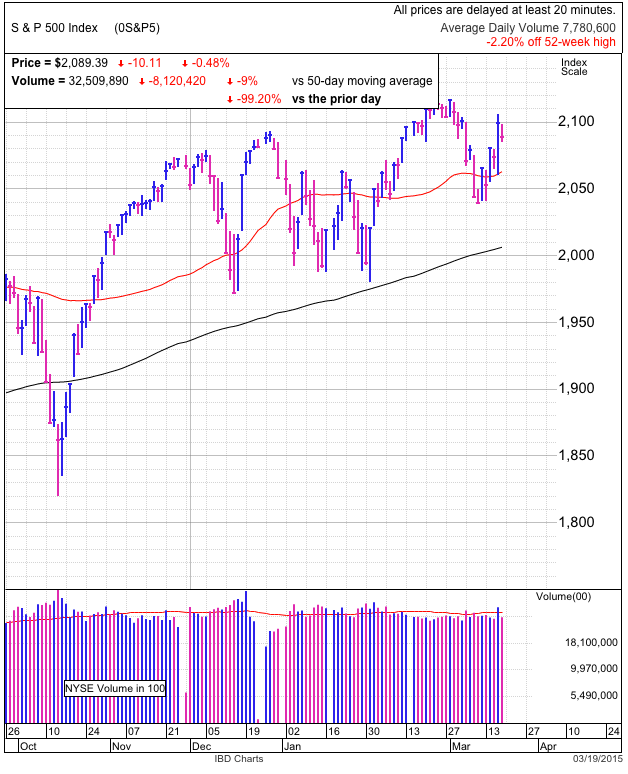 Stocks gave back some of the Fed pop Thursday, but remain well above prior resistance at 2,080. We cannot read too much into today’s pullback because it is healthy to give back a little of Wednesday’s huge move. The encouraging thing is the market traded sideways near 2,090 for most of the day and only showed modest profit taking. Holding this level through Friday’s quad-witching means owners and buyers believe in this market and we will likely retest all-time highs near 2,02. But if we cannot maintain these gains, watch out below because that tells us this pop exhausted all available demand. 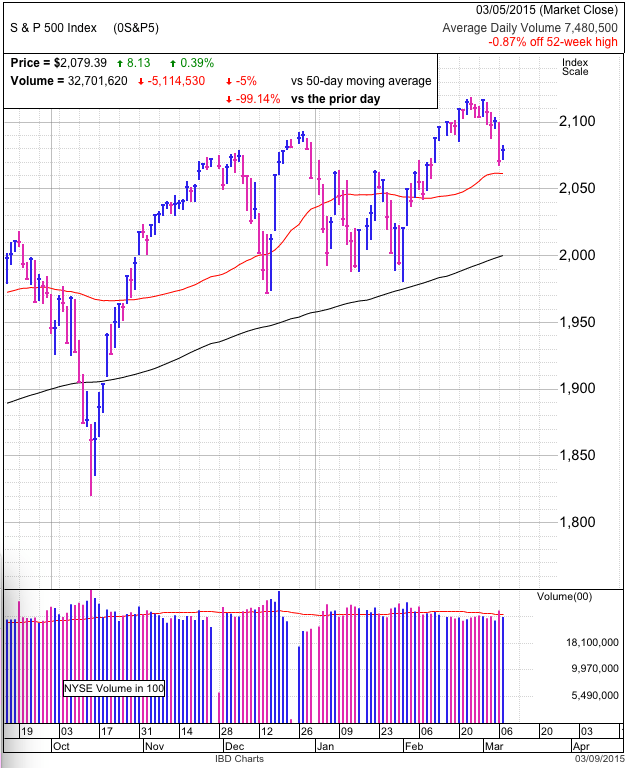 Stocks bounced impressively and retook the 50dma. The one dig against today’s move is it happened on lower than average volume. But regardless, this is the biggest up-day in weeks and nervous bulls are breathing a sigh of relief. It seems we are back in bizarro land since this sharp rebound was kicked off by abysmal retail sales. Traders addicted to easy money cheered the prospect of a weak economy and delayed rate hikes. Funny the world we live in where blowout employment tanks the market and pathetic economic news launches us higher. Yesterday I said we should be wary of a rebound without a high volume capitulation bottom. And that is exactly what we got today. While the market can change the rules on us at any time, every dip over the last year bottomed on the highest volume of the move down. But Tuesday’s plunge was on lower volume than Friday’s leg down. That tells us more owners chose to hold the dip than sell it and we are missing the traditional purge that is a common trait of typical “V” bottoms. This means 1) the market changed the rules on us, 2) this is a bull trap and it will fail soon, or 3) this is the first bounce in an extended sideways basing pattern. One possibility that the worst is behind us and two that we will retest Tuesday’s lows. While not scientific, 2 to 1 against this rebound sticking says we should be careful. But price is truth and we need to watch how it behaves in coming days. A bull trap can last two or three days before crumbling. But if the market is holding strong by early next week, then this is the real deal. Anything less and look out below. Wednesday was little more than a placeholder. We traded inside a 10-point range on less than average volume. The unfortunate thing for bulls is we saw similar price-action Monday, hours before Tuesday’s 1.4% plunge. The only positive thing out of Wednesday is the loss was limited to 0.2%. Few buyers are attracted to these discounts, meaning we need to fall further before value investors and swing traders start buying the dip. It was also a fairly painless decline, meaning we didn’t flush out the last of hopeful. Only two things will turn this around, buyers snapping up irresistible discounts or a soul crushing slide chases off the last of the sellers and we bounce on tight supply. So far neither condition is met, meaning this move is not done making new lows. The headlines are obsessing over rising rates and the surging dollar. But do we really need to worry about these things? We are fooling ourselves if we think the Fed controls interest rates. They stopped buying bonds nearly a year ago. When everyone expected rates to rise, they fell instead. If long-term rates wanted to go higher, they would have done so already. This means we can safely cross increasing interest rates off the list of things to worry about. The other fear is a strong dollar. But why is the dollar surging? Obviously because we are the strongest investment grade economy in the world. Hard to argue with that, I mean really, Europe? China? Asia? South America? We’re it. And as long as we look better than everyone else, expect foreign investment to continue flooding our markets and propping up prices. And now I’ve given you two pieces of contradictory information. Price-action that tells us that we are headed lower, but rational analysis of the fundamentals that say we have nothing to worry about. How do we settle this discrepancy? Easy. Time. Everything in the market is about timing. Expect the selloff to continue until we have an incredibly painful, high-volume capitulation. Then we buy the rebound before everyone realizes things are not as bad as the fear-mongering lead us to believe. It would be nice to see high-volume plunge Thursday morning that reverses midday and finishes near flat. That is the all-clear for us to get back in on the long side. Be very wary of any bounce that comes before a capitulation bottom, since that is likely a bull trap before the capitulation bottom. Is it Time to Buy the Dip Yet? The bloodbath continued as the S&P500 smashed through all kinds of technical support. 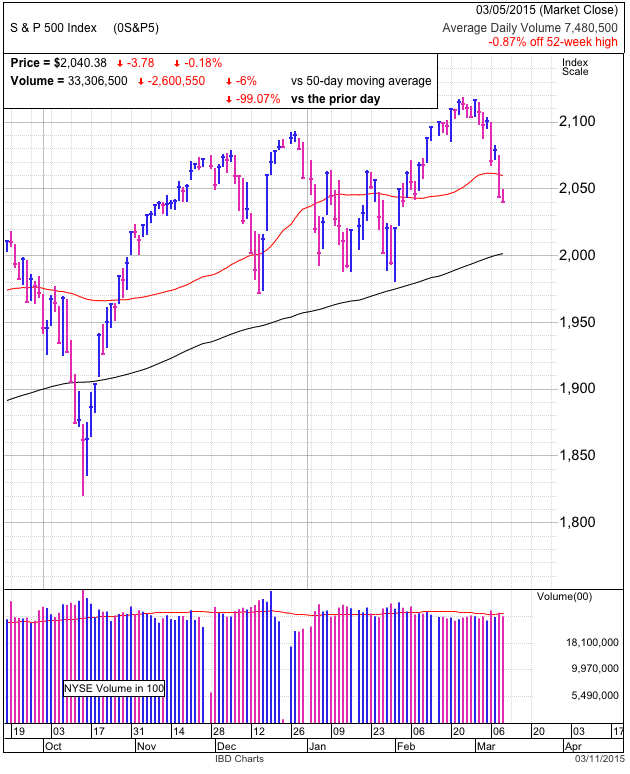 2,060, 2,050 and the 50dma could do nothing to slow this selloff. But as ugly as it looks on a daily chart, the intraday price-action wasn’t all that dramatic. We gapped lower at the open, but quickly settled into a sideways trading range between 2,050 and 2,060 for most of the day. Those that held through the early weakness were not unduly pressured by an extended intraday slide. 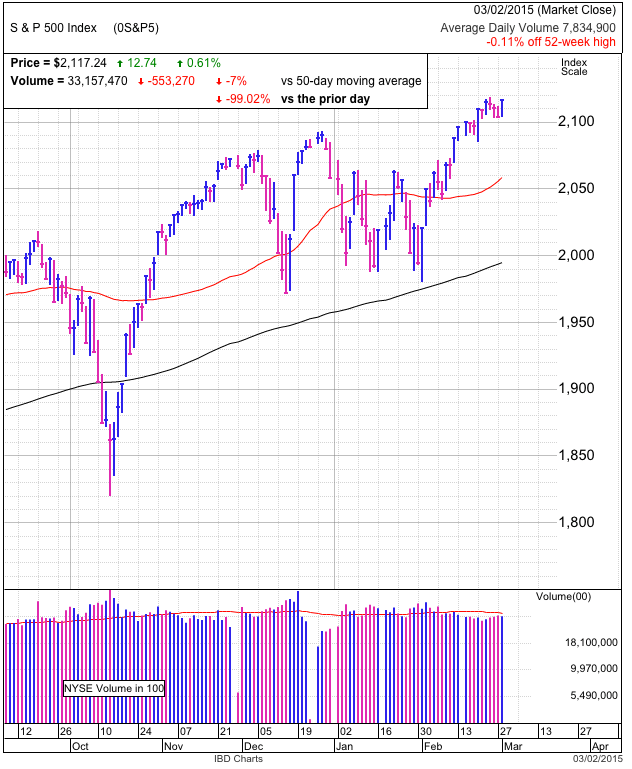 The lack of pain showed up in volume that failed to exceed Friday’s totals and barely finished above average. It is hard to claim the crowd panicked and rushed for the exits on such benign volume. There are two ways to interpret this. Either the tidal wave of selling hasn’t hit yet. Or we’re running out of sellers and this thing is about to bounce on tight supply. While we can logically rationalize the latter, recent history says bottoms form on the day with largest volume of the entire move. Using that pattern as a guide, today’s lower volume selloff is likely not the end of this. The financial press is trying to convince us the market is melting down because the Fed is moving their planned rate hikes forward a few weeks. Really? When phrased that way, it sounds just as absurd as it really is. So if this isn’t rate hikes, what is it? My money is on the surging US dollar since it pressures multinational companies’ overseas income. But while that is true, the one thing we cannot discount is the US dollar is exploding higher because we have the only global economy worth investing in. As long as global investors continue to throw money at our markets, rates will stay low and equities will keep going higher. While we will likely see more red before this is done, I suspect we are getting close to a near-term bottom. A morning plunge followed by an afternoon bounce on tremendous volume would be the best buying invitation we could ask for. Is the Worst Already Behind Us? Stocks bounced modestly following Friday’s bloodletting. We ended higher by 0.4% on less than average volume. The big headlines came from Apple’s product launch and the broad market followed AAPL’s lead higher, but it also peaked when investors were underwhelmed by the final version of the Apple Watch. Today’s low-volume bounce was largely a placeholder for what comes next. We need to go back to last Friday’s price-action to get a feel for where the market stands. As we discussed last Thursday, the market needed a capitulation bottom before it could continue higher. Was Friday that day? We clearly smashed through 2,090 support in a very painful intraday selloff. It was also the first day in nearly a month with above average trading volume. While both of those traits are what we were looking for, was it enough? Selloffs are rarely one day events and while the volume was elevated, it was well short of those that formed February’s capitulation bottom. 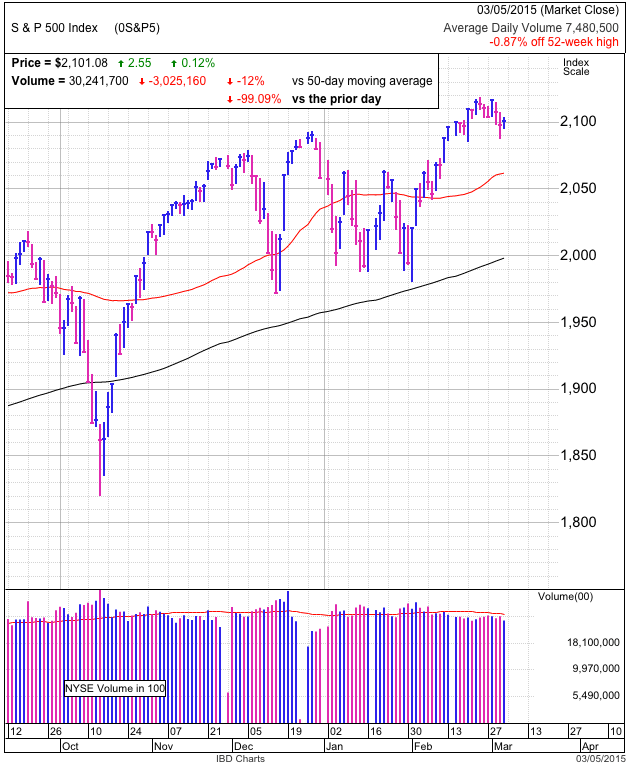 Both of these factors suggest Monday’s bounce is not the all-clear bulls are hoping for. While sentiment came in quite a bit, one last plunge under the 50dma would do a far better job resetting sentiment and clearing the way for a move higher. For this to be a “V” bottom, we need to rebound quickly and Tuesday is that day. If we don’t recover 2,090 tomorrow, expect this to correction to drag on a bit longer, either falling further, or at best trading sideways. There is no need to rush in and buy the dip. Let others gamble away their money trying to pick a bottom. Stocks finished modestly higher, hugging 2,100 support for most of the day. The low-volume gain was good enough to snap a two-day selloff as traders sat on their hands ahead of Friday’s employment report. While the financial media loves to hype up non-farm payrolls every month, it’s been years since the report materially affected the market beyond a couple of hours of volatility. Good numbers, bad numbers, and everything in between haven’t been enough to slow down our six-year old bull. And I don’t expect Friday will be any different. While pundits speculate about the risk of too much or too little, barring a black-swan catastrophe, employment will be ancient history by lunchtime. I’ve been rooting for the breakout, but its inability to mount any kind of follow through is concerning. Trading inside a tight, 20-point range shows both bulls and bears are stubbornly sticking to their positions. That leaves the rest of us wondering which side has more staying power. I gave the benefit of doubt to bulls because the market didn’t flinch in the face of bearish headlines from Greece, Ukraine, and China. It even rallied as the Fed’s rate hike chatter heated up. Markets that disregard bad news are the best ones to buy. But then we kept hitting a ceiling at 2,120. Demand completely dries up every time we approach this level and we slip back to 2,100 support. While confident owners who refuse to sell keep supply tight, we need fresh demand to keep pushing this higher. It appears like February’s strong performance sucked in all the potential buyers and now there is no one left to extend this move. While this would be a lot easier if the market went up every day, we know periodic pullbacks are normal and healthy. 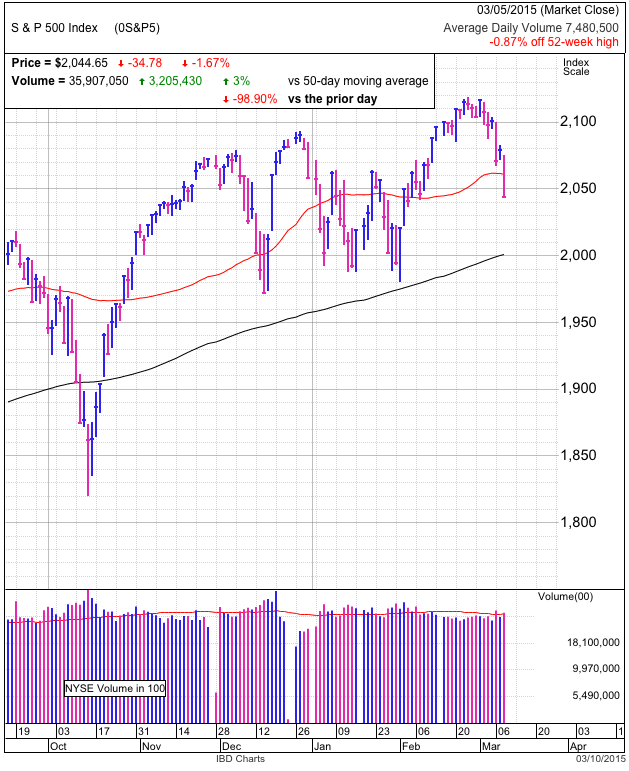 We shouldn’t fear a dip to the 50-dma at 2,060. Two red flags hinting at further weakness are the absence enthusiastic dip buying and lack of a painful capitulation bottom. The importance of enthusiastic dip buying is self-explanatory, but to find that bottom, we also need a brutal dip that flushes out the last of the hopeful. This is a relentless intraday selloff that punishes bulls by methodically marching lower until they cannot stomach the thought of watching another dollar evaporate. Only after the hopeful are flushed out and replaced with courageous dip buyers will we find the bottom. While the market sold off in recent days and undercut support, most of this weakness happened at the open and prices rebounded into the close. That price action is fairly easy to hold through since the afternoon bounce reinvigorates the spirit of the hopeful. It doesn’t feel like we’ve had that completely demoralizing day where everyone gives up hope and decides to sell before it can get any worse. Buying the high-volume capitulation is a great way to capitalize on other trader’s emotions. The market could bounce on Friday, but I need to see enthusiastic buying before I’ll be convinced. More likely this weakness continues until we refresh the bullish skew carried over from February’s strong performance. Stocks slipped half-a-percent Tuesday, but it was actually a productive day. There was no headline driver for the opening weakness and it appeared like selling for selling’s sake. Monday’s “NASDAQ 5,000” headlines probably spooked a certain contingent and they placed overnight orders to sell the “obvious top”. The cascade of selling continued into mid-day where the market undercut 2,100 support. But just as things appeared to be spiraling out of control, supply dried up and we recovered half of the earlier losses. While this would be more fun if every day ended in the green, I was actually impressed with the market’s resilience. If we were at overbought levels, today’s technical weakness would have been more than enough to trigger a wider wave of selling. When the market is poised to move one direction, all it takes is the smallest of excuses to get things rolling. If the market wanted to go lower, this was the perfect invitation. But we bounced instead. This tells me we are not excessively overbought and on the verge of collapsing. While we struggle to find buyers above 2,120, we also cannot shake free sellers under 2,100. One of these day’s we will move out of this tight trading range. The market’s non-reaction to recent bearish geopolitical headlines and looming rate hikes tells us owners are confident and reluctant to sell. Right or wrong, it doesn’t matter. When no one sells, supply remains tight, and prices inch higher. But all of this is null and void if we cannot climb out of this range. The longer we hold near 2,100, the more likely it is we will come across a dip that doesn’t bounce. I need to see today’s supportive trade continue. Another test of support probably won’t end as well for bulls. Stocks bounced back from recent weakness as the NASDAQ closed above 5,000 for the first time since the peak of the dot-com bubble. While it is natural to draw comparisons to those go-go days, the underlying economics couldn’t be more different. Fifteen years later we finally grew into those lofty valuations and almost all the biggest tech companies are now boring dividend investments. But since everyone wants to talk about bubbles, the one thing we all can agree on is they go waaaaaaaaaay too far before bursting. Markets don’t correct after getting a little carried away, they cross state lines and end up in Mexico before slowing down. While it is getting harder and harder to find good deals in this market, there is still plenty of room to go before this market screams of frothy excess. Shorter-term, recent headline fear-mongering and weak price-action opened the door to wider selling, but bears just couldn’t get it done. When markets have every excuse to sell off, but hold steady instead, we have to respect that behavior and cannot fight it. While bears might ultimately be right, bulls are making all the money. It’s cliché, but I’d rather make money than be right. I remain concerned about the elevated bullishness, but the price-action tells us this move isn’t done. Watch for either further sideways consolidation before moving higher, or a quick run up before pulling back to support. 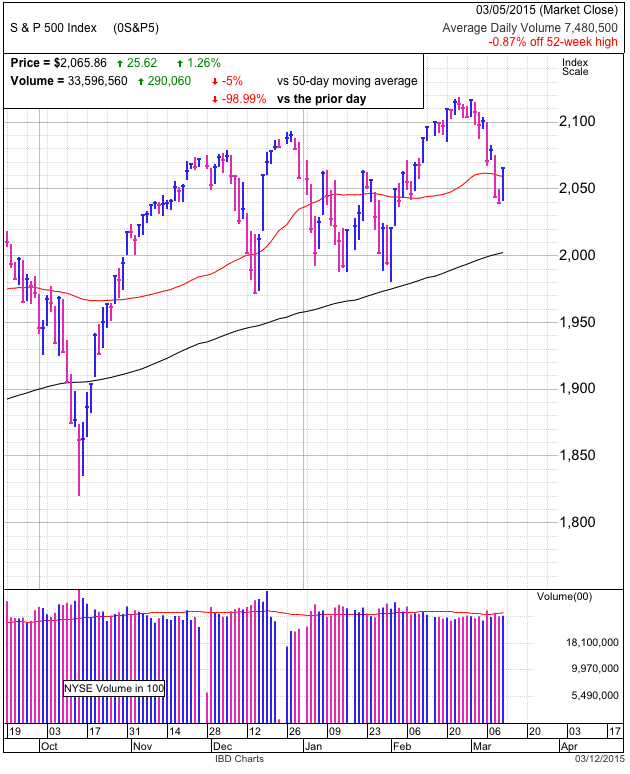 Tuesday will give us an indication of what the market intends to do next.